Arriving in 10.6- and 12-inch versions, Samsung's new tablets are packed with productivity features—plus the inevitable extra trick for Samsung enthusiasts. If Samsung can beat Microsoft’s pricing, then it may just have a wily competitor to the Surface Pro line. 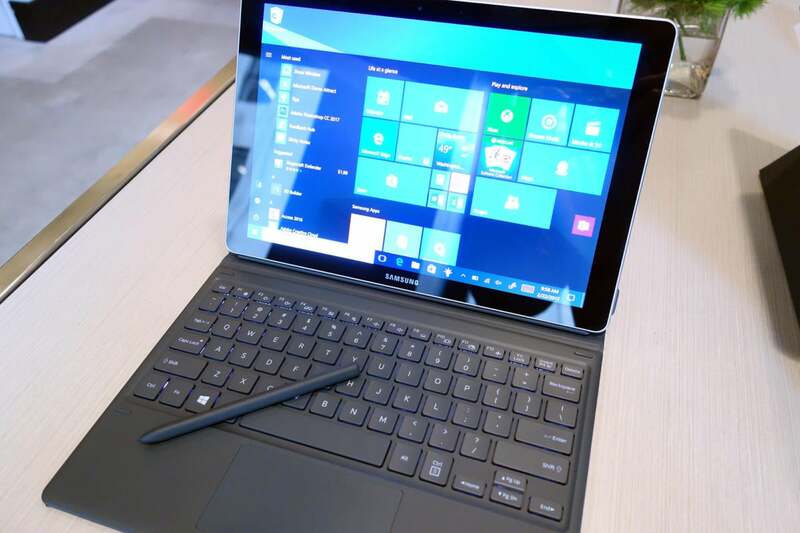 On Sunday, Samsung announced Galaxy Book, a 2-in-1 Windows 10 tablet that’s packed with productivity and entertainment features, and immediately evokes thoughts of the Surface Pro 4 the moment you see it attached to its Pogo keyboard. Unlike the Surface, which boasts just a single screen size (a 12.3-inch, 2736x1824 display), the new Galaxy Book comes in 10.6- and 12-inch versions. The smaller Galaxy Book features a traditional TFT LCD display at 1920x1280, but the 12-inch model rocks a breathtaking, HDR-capable AMOLED display at 2160x1440. And, remember, these are Windows tablets, so Intel silicon runs the show. 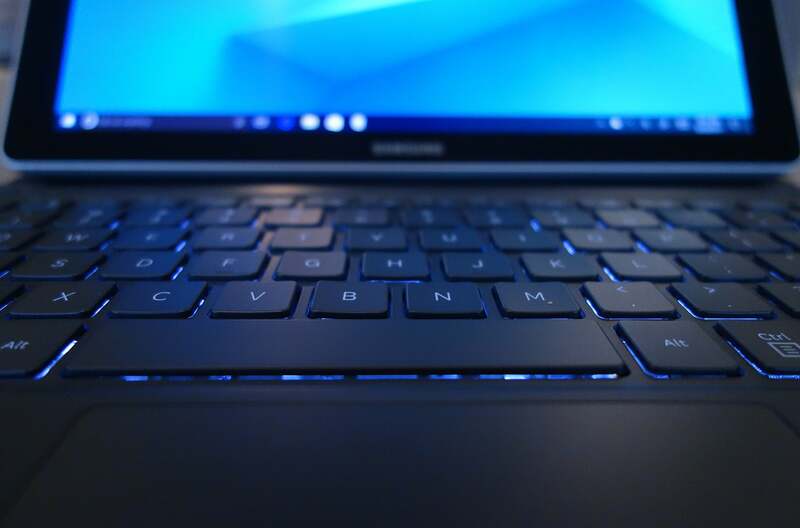 The 10.6-inch Galaxy Book includes a 7th-gen Core m3 running at 2.6GHz, while the premium model boasts a 7th-gen Core i5 running at 3.1GHz. Here’s the 12-inch Galaxy Book, complete with Pogo keyboard and updated S Pen. It’s all very PC-like. And that’s not bad for a 7.4mm tablet that comes with a solid typing experience and strong pen support. Why this, why now? The two Galaxy Books slide nicely into Samsung’s mobile productivity story—a narrative that’s missing the Note7 flagship phone, certainly the most useful phone in the world before it fizzled and died. 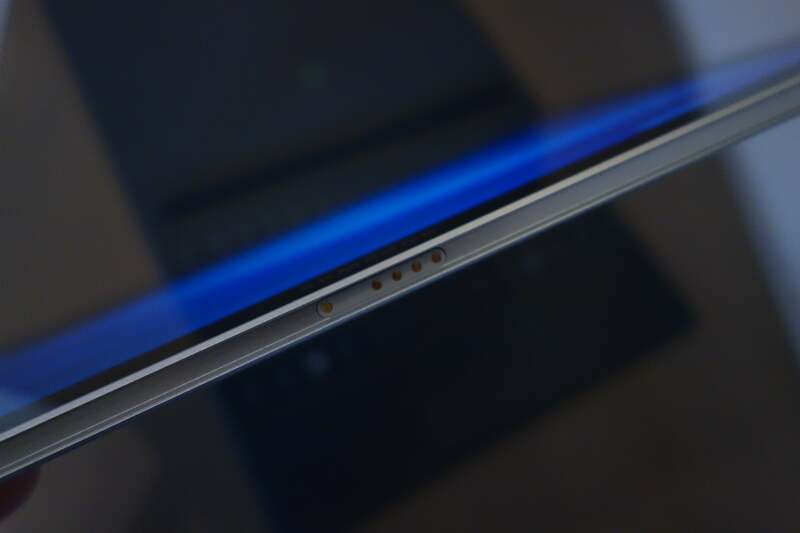 I spent about 20 minutes playing with the larger Galaxy Book, and was impressed with Samsung Flow (which sends Galaxy smartphone notifications straight to the Galaxy Book); the Pogo keyboard (which has three levels of back-lighting, and 1.5mm of key travel); and the new S Pen (which triggers Samsung’s “Air Command” menu options for a whole bunch of cool productivity features). In all, it’s a compelling package that may satisfy the curiosity of Samsung diehards while the company preps the follow-up to the not-so-flame-retardant smartphone. And, hey, if the Galaxy Book can attract some would-be Surface Pro buyers, that’s good news for Samsung too. The Pogo keyboard has three levels of backlighting. Samsung demoed the Galaxy Book 12’s AMOLED display by playing a video with High Dynamic Range (HDR) support, and the color saturation was amazing. Granted, there’s not much HDR content currently floating around, but if you want to prepare for the next big thing in video, the larger Galaxy Book is ready. Equally fun: the animated GIF creator that pops up in Samsung’s Air Command menu. Just hover the S Pen over a hotspot on the right side of the display, and you’ll get a snazzy menu of various productivity features. There are Air Commands for screen capture, PDF annotation, display magnification, and a few other things, but it’s the GIF creator that will keep you busy turning videos into quick, easily shared animations. You can become the most annoying person on the Internet in seconds! The Pogo keyboard attaches to this connector, and requires neither charging nor Bluetooth tethering. The S Pen includes more than 4000 levels of pressure sensitivity, and doesn’t require any charging or Bluetooth tethering to the tablet. There’s also a special S Pen feature that’s only available on this Windows 10 machine: the ability to tilt the pen to create brushstrokes of various widths. To this extent, the Galaxy Book becomes a strong tool for artists—and it’s something that’s not yet available on the Surface Pro 4. Unfortunately, though, there’s no way to physically tether the S Pen to the tablet once you shut down—no pen loop, and no storage hole built into the chassis. Samsung’s Pogo keyboard gives the Galaxy Book its 2-in-1 Windows laptop vibe, and in my limited time with it, I found it just as comfortable to use as Microsoft’s Surface keyboard. The key action just felt good at 1.5mm of travel, and the bright back-lighting was impressive even in a well-lit demo room. And, remember, it’s not a Bluetooth keyboard, so you don’t need to worry about batteries, charging or tethering. But Samsung Flow may be even more impressive in the big scheme of Samsung’s productivity story. First introduced with the Galaxy TabPro S, this feature pushes notifications from your Galaxy phone to the new Galaxy Book. The usphot is that if the two devices are tethered via Bluetooth, your phone’s emails and text messages will appear on the tablet, and you can reply to them from a Samsung Flow interface on the Windows 10 machine. Sadly, Samsung Flow only works with Samsung Galaxy phones, but it’s a great tool for consolidating all communication on your desktop. And it should come in even handier if your phone is sitting in another room. Samsung will have optional LTE versions of both Galaxy Book sizes. The 10.6-inch tablet comes with 4GB of RAM, and either 64GB or 128GB SSDs. The 12-inch version has two memory options: 4GB RAM paired with a 128GB SSD or 8GB RAM with a 256GB SSD. And all versions come with microSD support for another 256GB of storage, as well as fast-charging batteries. Price? Availability? Both are unknown at press time. But if Samsung really wants to make some waves, it will aggressively undercut Surface Pro 4 pricing. Sure, the Galaxy Book offers a few compelling unique features, but it’s still a Windows tablet playing in a competitive space.